Boston Dynamics has created a Karate Kid robot ‘Atlas’, which stands 6 feet 2 inches tall, and weighs around 330 ponds. The robot is also called Ian, and was featured in an online video yesterday evening. He is in a similar pose like that of Ralph Macchio in the legendary movie named The Karate Kid, which released back in 1984. 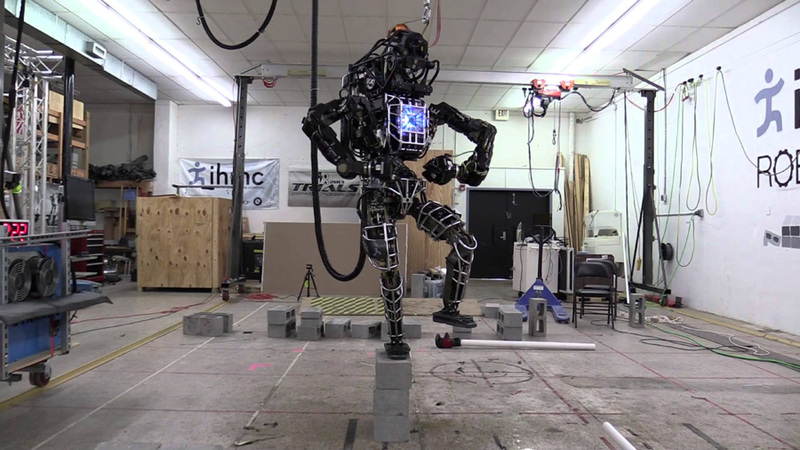 In the video featured online, the robot has been slowly raises its arms, and brings them back down. Ian is reffered to as Atlas also, as it means ‘being capable of’, hence the researchers and scientists believe this new innovative invention is capable of a lot of things. It has two laser cameras fixed in its head, due to which the robot can see! It has inbuilt hydraulic actuators, which are a whooping 28 in number and they can thus make a wider range of movements, and perform tasks as similar to that of human beings, with great ease and perfection. It would certainly in all probabilities steal the show International Robotics Challenge. Its still in progress, some work is still impending as they want a workable external power supply so that it can be moved from the inception place.